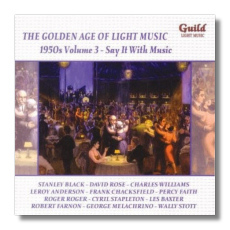 The 1950's, Volume 3 "Say it With Music"
These three CDs provide a veritable treasure of light music items that traverses a whole generation of composers and artists who were famous in their heyday but who have now long since vanished from the scene. 'Bandstand in the Park' focuses on several brass bands that almost walk past you in their ghostly uniforms with the clapping of the crowds who used to attend their vast concerts also long since vanished into lost time. Popular pieces such as the Royal Air Force March, 'Dance of the Tumblers', 'Golliwog's Cakewalk' and others mix with the unfamiliar. 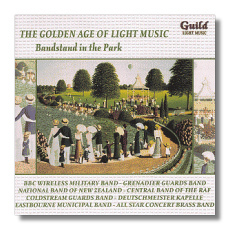 The bands were also stalwarts of their time and include such luminaries as the BBC Wireless Military Band, the Band of the Queen's Royal Regiment and the Central Band of the RAF. This release is very pleasant indeed and highly enjoyable especially with David Ades' excellent commentaries. 'Buried Treasures' is slightly more exotic in its content featuring a number of pieces by some obscure composers but the final collection of melodies by Robert Stolz is truly something to shout about. Other beautiful pieces include 'The Girl from Cuba', 'Secrets' and the delightful 'Pizzicato Rag' although the whole disc contains a veritable host of beauties. 'Say it With Music' recalls those nostalgic times in the 1950's when light music was in its heyday although the end was not far off. We have more familiar pieces and composers here such as Robert Farnon, Richard Rodgers, Richard Addinsell, Clifford Curzon and George Melachrino amongst others. There are some interesting films themes such as Nascimbene's 'Song of the Barefoot Contessa' which apparently was a sensation in those days. 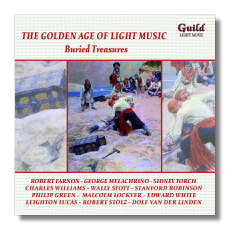 Yet another delightful collection to add to the ever growing lists of Guild's magnificent tribute to the Light Music genre.